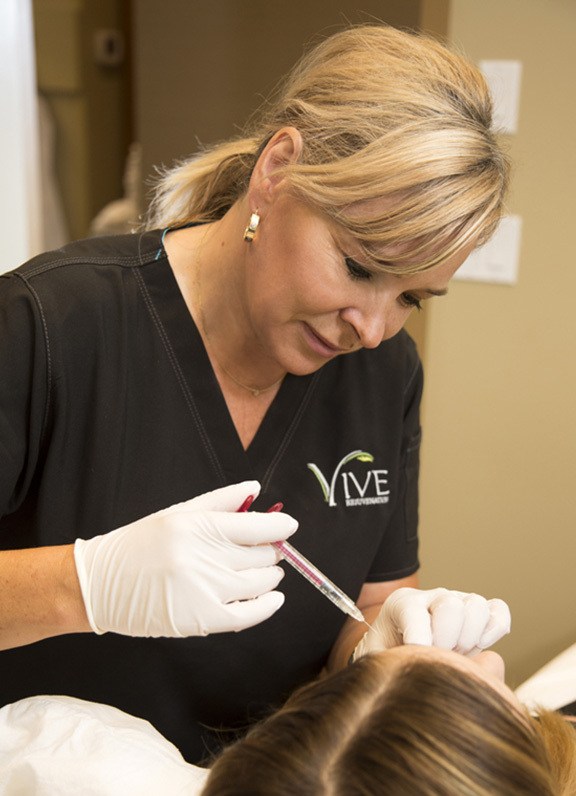 Lisa has been a registered nurse for 28 years, with 12 years of direct injection experience in cosmetic and aesthetic medicine. Safety, balance, appropriate treatments, a natural look with long lasting results are the messages she gives to her happy clients, ensuring they “Look and Feel Fabulous’ after every treatment. Lisa specializes in the MDCodes™ Eight Point Non-Surgical Lift for dermal fillers as well as the Cannula Injection Technique for dermal fillers. Lisa attended the 2016, 2017, and 2018 Allergan Medical Institute – MDCodes™ Unlocking the Code from Youth to Maturity Training Program, also known as The 8 Point Non-Surgical Lift for facial dermal fillers, presented by renowned plastic surgeon Dr. Mauricio de Maio, for advanced injection techniques. Lisa follows the the MD Codes™ Formula for Juvederm® and Botox Cosmetic®, using the advanced concept of Foundation, Contour, and Refinement to help our clients achieve a positive, natural, refreshed, and uplifted appearance. We use the MD DYNA Codes™ technique to help our clients express themselves in a positive, refreshed, and confident manner. It is all about Dynamic Ageing and Dynamic Beauty. Lisa also participated in the exclusive 2016 and 2017 Allergan Medical Institute Nurse Symposium for advanced injection techniques and safety protocols. Lisa has participated in the exclusive Allergan Academy FACE Conference for the last 10 years where new products, techniques and safety protocols are reviewed by a group of advanced injectors, plastic surgeons, dermatologists, skilled physicians and nurses. Lisa has extensive experience in dermal filler contouring for the mid face, cheeks, chin, lips, and jawline. Lisa is at Vive® on Wednesdays, Thursdays, Fridays and some Saturdays. Lisa’s favourite treatments: OxyGeneo Super Facials, PICO Genesis for face, neck, chest and hands; Venus Legacy for face and neck; BOTOX® Cosmetic injections and Juvederm® treatments. Lisa’s favourite products: ZO Skin Health Hydrating Cleanser, Daily Power Defense and Growth Factor Serum; Vivier CE Peptides Vitamin C Serum and Grenzcine Neck Creme.